Nothing beats putting your personal imprint on your vehicle. Some drivers order vanity tags, while others engrave their initials in the window tint. We take it a step further by enhancing the actual design of your exhaust system. At Mecklenburg Automotive & Collision Center, we have the means to make a factory-style exhaust system or a complete custom system. We offer factory catalytic converter replacement and aftermarket converter systems to help keep the cost down. You can have more control over your vehicle’s design and performance with a customized exhaust systems. Bring your vehicle into our shop and we’ll show you everything we’re capable of, right here in our facility. We bed and fit all of our exhaust pipes from heavy gauge aluminized pipe. We also offer stainless steel pipe. Both style pipes come in sizes 1 ½ – 3 inches. Larger size pipe up to 5 inch is available upon request. Our muffler selection is wide from popular names such as Flow Master to Econo Fit and all types between. Depending on the application your vehicle needs, all of our custom systems can be clamped or welded. Exhaust tips are available in many different styles in either chrome or stainless steel. We keep many in stock and can order a large variety, if needed. Give us a call! We’d love to get started making your vehicle a truly unique driving machine. Discovering and delivering your personal vision for your customized exhaust system is our pleasure. We love what we do, and meeting all your expectations is our favorite part. 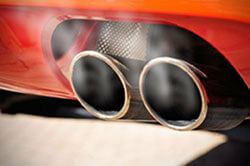 Many exhaust systems can be estimated over the phone, so stop wondering and give us a call today! Custom or repair need to be seen in person for a proper estimate. All of our complete or cat-back systems are covered by a lifetime warranty. Let us customize your exhaust today!